The Federal Government on Tuesday projected a 10 per cent growth in the Nigerian maritime industry. 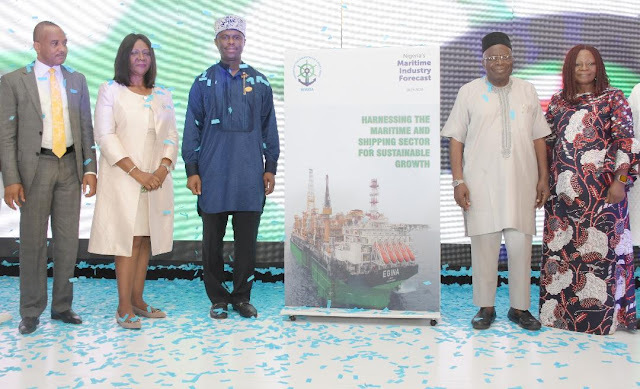 This was contained in the 2019/2020 maritime forecast unveiled by the Nigerian Maritime Administration and Safety Agency (NIMASA) in Lagos. The forecast, the second in the series, tagged “Harnessing the Maritime and Shipping Sector for Sustainable Growth. “The maritime sector has the potential of contributing at least 10% of Nigeria’s GDP in no distant future, as Nigeria has the biggest market in Africa; and generates about 65-67% of cargo throughput in West Africa, and 65% of all cargo heading for these regions will most likely end up in the Nigerian market,”the DG said. A consultant and faculty at the Lagos Business School, Dr. Doyin Salami, who reviewed the forecast, noted that it was intended to provide the context in which the sector will operate in 2019 to 2020. Salami said it was expected that in 2019, the Petroleum Industry Bill (PIB) will be passed; the anti-piracy bill will become law, and more International Maritime Organisation (IMO) conventions would be domesticated in Nigeria.